The EasyPal Main Screen is the most used screen within the Program. From here you can control all the main functions within EasyPal... switch to TX.. Change Modes.. Load Pictures, View past received and transmitted pictures and much much more. The EasyPal Main Screen with TX Picture window activated. SLIDER + marker Adjusts the amount of jpeg-2000 compression applied to the Picture. Higher compression results in more Picture degradation. GAMMA < > Adjusts the GAMMA Correction of the Selected TX File. 11 Missing segments = 11 segments remaining for a complete receive. TRANSMIT When Clicked this Button switches to TRANSMIT. WAV Allows selection and Loading of a WAV audio file for Transmission. 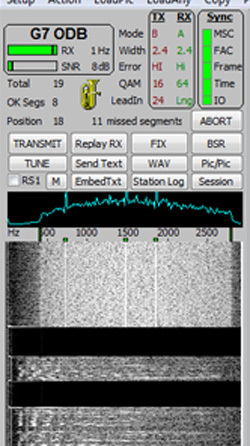 the selected wav file at the end of each transmission. The "remove" options clear the appropriate selections. Click "TX Now" to transmit the selected wav file immediately without transmitting an image. 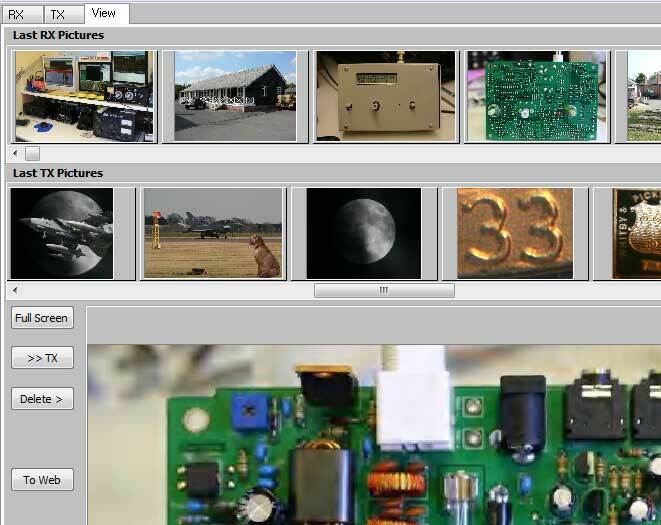 PIC/PIC Allows you to select Multiple Pictures within a Picture for Transmission. Select an Image for transmission using LoadPic.Click "Pic/Pic". Select another Image to merge with the first. This Image can be resized and moved as required. Additional Images can be added as required. An additional small window also appears that allow you to enter and add Text to the Images. Click "Merge to TX" to complete the montage and process the completed Image for Transmission. EMBEDTXT Allows Text to be Embedded within a Transmission. See ACTION MENU USER DETAILS EMBED TEXT for more details. Box and "RS1" Left click to toggle RS encoding for transmitted files. Right click the TEXT to toggle the 4 levels of encoding. Shows the current RS Type Encode setting. See GLOSSARY. M Opens a Small RX Monitor window and closes the Main Screen window. Very useful if you want to Monitor Received Images while doing other things on your PC. Screen is resizable. TX shows the current Mode settings for TX . DRM submode selected for transmit. Right click mode parameter to toggle through settings. Any changes to the mode are saved for future sessions when the program is closed. Default DRM Mode should be Mode B, Width 2.5 khz, Error HI, QAM 16, and LeadIn 24. Interleave is always Long and cannot be changed. These settings are the best choices for general use on the HF bands. may be too short a time for all stations to achieve MSC sync before the transmission is finished. In this case, select LeadIn 24.
operator to make any changes for receiving any DRM mode. CALLSIGN Shows the CALLSIGN of the Transmission Station. Note the Validity of the Callsign is not checked. The Displayed Callsign is simply the Callsign entered by the Transmission station in Setup. However, other EZ programs may be desired. Right click the CALLSIGN and the desired program exe file may be selected. Double clicking the callsign for the first time will load the selected program. POSITION The Current Segment Number being received. The TUBA GRAPHIC Plays a few Notes of a Tuba as a Transmission ! The Levels of your RECEIVE SIGNAL from Receiver via Interface to PC Soundcard have a direct effect on these Indicators. MSC is the most difficult to lock.. careful adjustment of your Received signal level may be necessary to obtain constant MSC lock. This Bar only appears when a Valid signal header has been received and the receive signal is being processed by EasyPal. Depending on the Mode of Transmission RED lines in the Progress Bar may result in a FAILURE TO DECODE message after reception completes. A BSR request can be used to ask the Transmission station (or any other station that has the requested information) to re-transmit a FIX transmission to Fix (Repair) the Corrupted Receive file. Beware: The FIX transmission re-transmits the requested Segments of the corrupt file several times. A FIX can take much longer to Transmit than the full Picture. If you have many errors in the Progress Bar the quickest way may be to Re-Transmit the entire file again. The First Lower Window displays an Oscillograph representation of the Receive Signal. Displayed as a Blue Line the height of which relates to the frequency response of the received signal as it appears on your Soundcard. This display shows in REAL TIME. The Three Channel tones used by EasyPal should be shown as Three Peaks in the waveform. For Best Reception the frequency response should be as flat as possible with three distinct peaks corresponding to the three channel tones being transmitted. 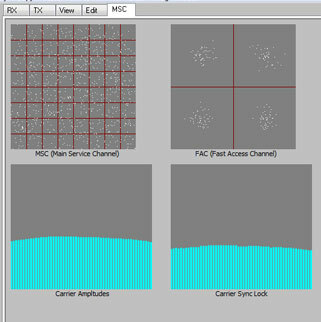 This Picture shows Valid reception of a TEST signal in the WATERFALL WINDOW. 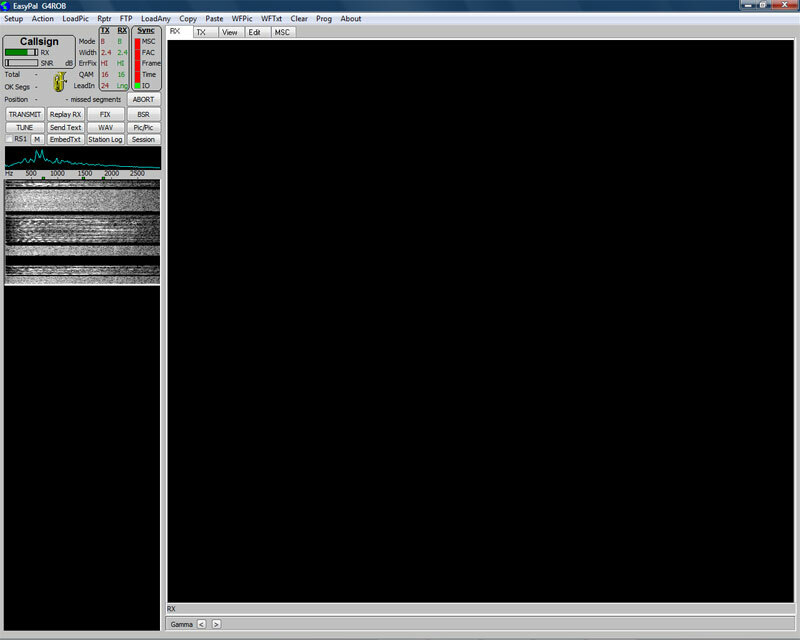 The Three Peaks in the Received Waveform... Blue Peaks in the First Window. The Three Channel markers.. GREEN Blocks.. which confirm correct alignment of the transmitted tones. The Waterfall screen SCROLLS Downward as time progresses. Each box shows each data bit received as a dot. This is displayed in a FILO buffer. The buffer is averaged over 10 displays. In the ideal case, the data will be one bright spot in the middle of a box. If the data dots drift too far from the centre, an error will occur. This can be repaired by the DRM error correction and further with the encoded mode. However too many uncorrected errors will cause data loss. FAC Fast Access Channel. 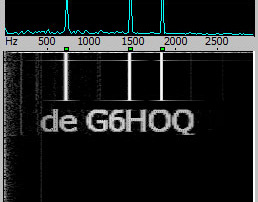 Sends at a low baudrate (QAM4) of the callsign, decode parameters and sync info. The FAC box shows the decoding of this channel in the same way as the MSC. However the FAC channel is always QAM 4, as this info cannot have any errors. This is sent at the beginning of TX and at the end. It can also be sent 4 more times during TX if the "Repeat Header (highly recommended always ON)" is checked. This helps in poor conditions. There are occasions when sufficient data has been received, but no filename so no decode. Each vertical line shows an individual carrier and the height is the amplitude of that Carrier. There are a different number of carriers according to the mode. In an ideal situation, the top of the carriers should be a straight LEVEL HORIZONTAL line... all Carriers having the same amplitude. Receive filters etc also effect this in the same way. This shows the phase decoding success for each carrier. The ideal is again straight HORIZONTAL line. When a carrier or carriers lose sync (doppler, multipath etc) the vertical height of the failed carrier will jump higher or lower. Too many bad syncs causes data loss. DELETE > Deletes the currently selected picture from the relevant Easypal folder. Use with CARE !